Rick Riordan is a big hit with my kids. I read the Percy Jackson series that my children enjoyed so much (I thought it was well done and offered a great way for young readers to start making sense of the complicated relationships in classic mythology. And on the heels of this success, Riordan attempts to do what he did for Greek mythology with Egyptian mythology. Enter, The Red Pyramid. Perhaps Riordan tries just a little too hard to recreate the Percy Jackson magic as the similarities are a little too close, which feels a little strange to write, since I would describe the action differently than I would describe the Percy series, but in the reading (listening) it felt weirdly similar. In The Red Pyramid, we have Carter Kane, son of an Egyptologist and used to traveling the world with his father. Carter’s little sister, Sadie, has been sent off to live with her grandparents in London, so Carter and Sadie haven’t spent a lot of time together. But during one of their times together, during the Christmas holiday, their father brings them to the British Museum where a mysterious figure appears and does something to make their father disappear. Carter and Sadie learn that the ancient Egyptian gods are awakening and that somehow Carter and his family are the key to controlling these gods. There is plenty of excitement and a lot of action and, like the Greek gods series, a good deal of education about the different gods’ relationships and powers. But unlike the other series, there is also a fair amount of … I’ll call it goofiness … that I just found annoying. Specifically, the orangutan. Yes…there is an intelligent orangutan that plays an important role in the action, and it feels like a Disney-fication of the book (let’s put in some funny animals that interact with the humans!). Carter and Sadie are perfectly fine as the protagonists of the book, and their relationship feels very true, but the course of action feels very ‘made.’ Things happen around them, but they don’t seem to happen as a result of their plans or even as part of a plan against them, even though that’s not quite the case. It’s just that Sadie and Carter almost appear to be extras in their own story. I listened to this book on Audible. The book is set up so that both Carter and Sadie tell part of the story,and the Audible version has two readers, Kevin R. Free and Katherine Kellgren, reading these parts and they do a really nice job. In fact it was the quality of the reading that kept me going with this as I thought the story itself was just too much of a pastiche of YA fantasy novels. Free really captures the innocence and wonder of the youthful Carter and Kellgren is very believable as the young Sadie. Any disbelief, specifically in regards to how old Carter and Sadie act, is on Riordan, and not Free or Kellgren. Looking for a good book? 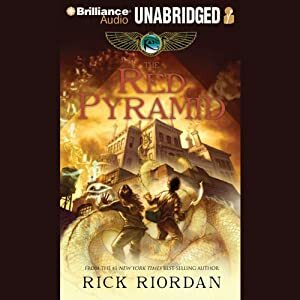 Lighting doesn’t strike twice for Rick Riordan, as The Red Pyramid doesn’t hold the same magic as Riordan’s more popular Percy Jackson series, though the readers of the Audible book male it lively and fun.